This week I have a review of a photo studio for you. It’s a place we’ve all been, a place we keep going back to… the DMV. For starters, the wait was brutal. I sat there for an hour looking at the little ticket with my number on it like I was about to win the lottery. Confession: whenever my number gets called, (C-26 in this case), I have the strong urge to yell “BINGO”. But I never do. Anyway, the person behind the counter was actually quite pleasant. She didn’t seem amused by me at all, although she did squeak out a courtesy laugh at one of my jokes of admittedly marginal comedic value. And the photo isn’t even awful, even though I didn’t think to make myself look cute even though I KNEW I was going to the DMV. All in all, I give the DMV Photo Studio 3 stars. Now, on to more fun things: Christine’s Bridal Shower. I’m so excited to show you these photos because this is a very creative and fun shower that includes lots of personal touches. Christine loves to cook, so her shower had a cooking theme. Instead of signing a regular guestbook, the guests were asked to sign in a cookbook, next to a favorite recipe. Christine promised to invite them over for a dinner including their favorite recipe, which I thought was such a sign of what a giving and warm person she is. I absolutely loved tying this in to something to bring them together again in the future! 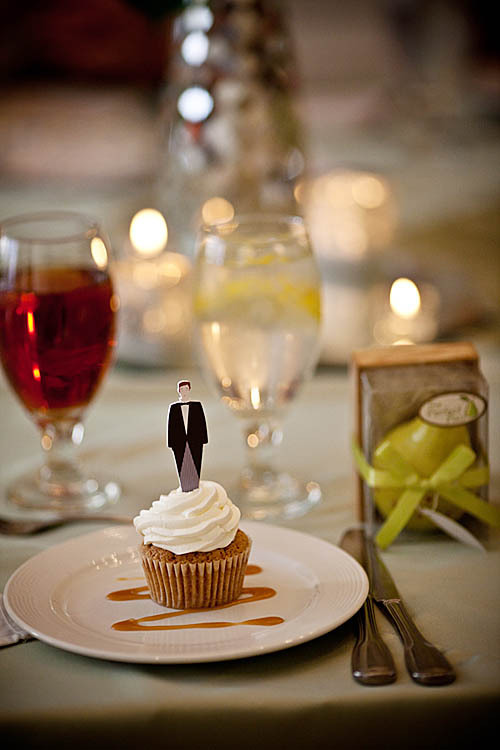 The table at Druid Hills Golf Club was set beautifully, and featured these fabulous favors, pear-shaped kitchen timers. Showers always include games, and this one I actually wanted to play! There were a number of glasses filled with spices, and guests were asked to guess by sight, smell or taste what spice was what. And finally, guests could also give the gift of one of their favorite recipes, placed in this cute little tin for Christine. Everyone has favorite recipes, it seems so wonderful to be able to share those with someone starting their married life! Can I just say how adorable these cupcakes are? Half had a bride, half had a groom. The gifts were of course, cooking-related. It never ceases to amaze me the cool, clever gadgets for the kitchen. And even more fun was seeing Christine’s genuine joy and gratitude at each gift. But I think my favorite part was the speeches. There’s nothing I love more than hearing people talk about exactly what is so special about their loved ones. I feel so grateful to have been able to hear the genuine outpouring of affection for Christine. Any time people are moved to tears by love, it’s a beautiful thing. Thanks, Christine, for allowing me to be a part of such a fun, creative, and beautiful event!